Had a chess match with a friend the other day, and this wine fitted perfectly the rather contemplative mood. 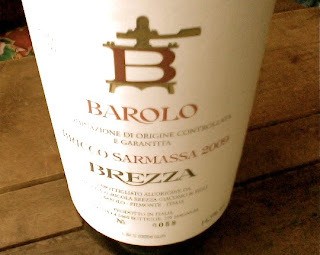 Grapes come from the Sarmassa vineyard in Barolo commune, and this Bricco Sarmassa is made only from a small and high-lying portion separately from the normal Sarmassa, and is not bottled every year. An intoxicating and thought provoking aromas: jellied raspberries, virginian pipe tobacco, chipotle chilies(interesting! ), rose petals, leather, a bit mossy earthy notes and crushed rocks. Also a nose that evolves; after coming back to it there seems to be happening always something new. Quite silky and smooth on the palate; rose petals, bright raspberries/strawberries, liquorice, smoke and tar. Strongish acidity, and powerfull, but already a bit polished tannins. The pure and intense fruit is upfront at first, but finishes quite savory and earthy. Despite the dryness and almost saltyness, there`s a kind of "inner sweetness" here, which gives a nice balancing touch. The beauty and power of the finishing lift just makes me smile. Has a minutes long, ashy aftertaste of cuban cigar, dried strawberies/raspberries, liquorice and tar. A home run Barolo from a challenging vintage.